I was recently asked to survey the floors at a substantial property in Bucklebury which used to be a school. At some point in the 1970’s there was a major makeover and the property was converted into two houses. 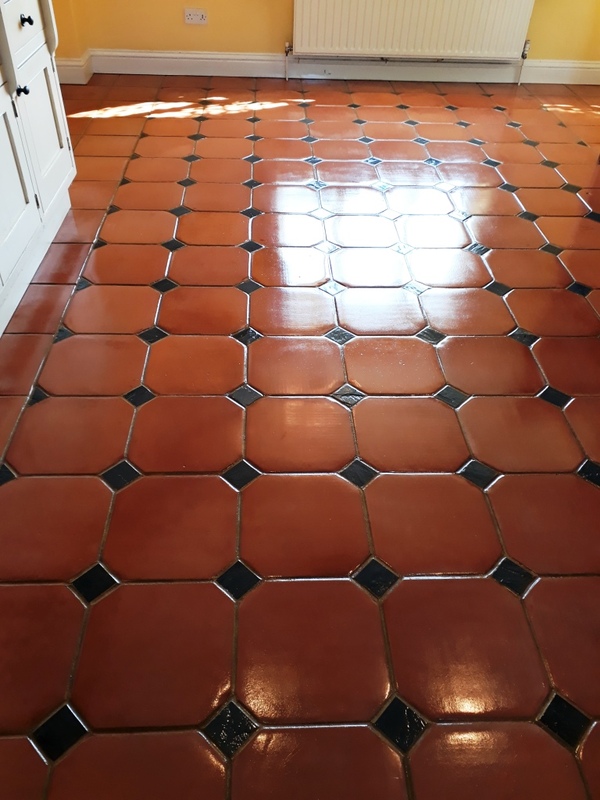 During the conversion a combination of Terracotta and Quarry tiles were installed throughout the ground floor and then sealed with what we believed was a wax-based product. 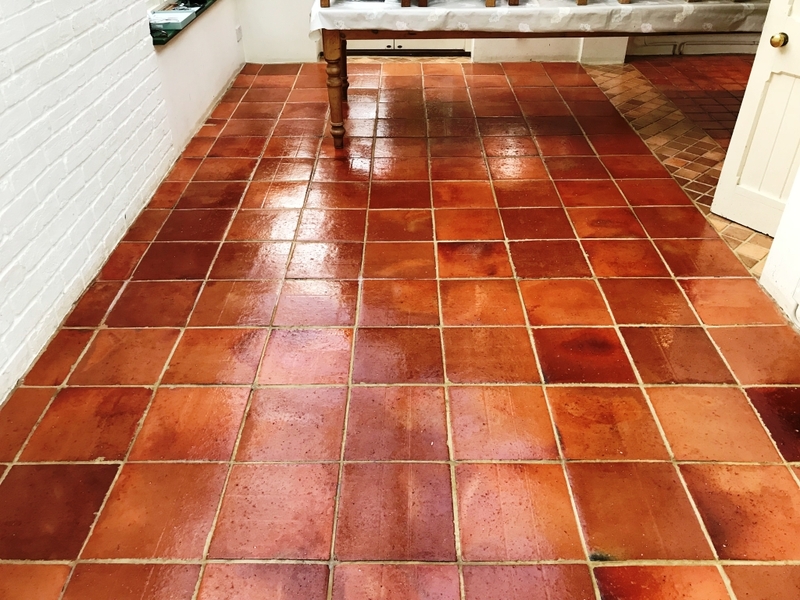 Although Wax was a traditional sealant for Terracotta there are better modern sealers available now that are designed for the job and so we don’t recommend it. 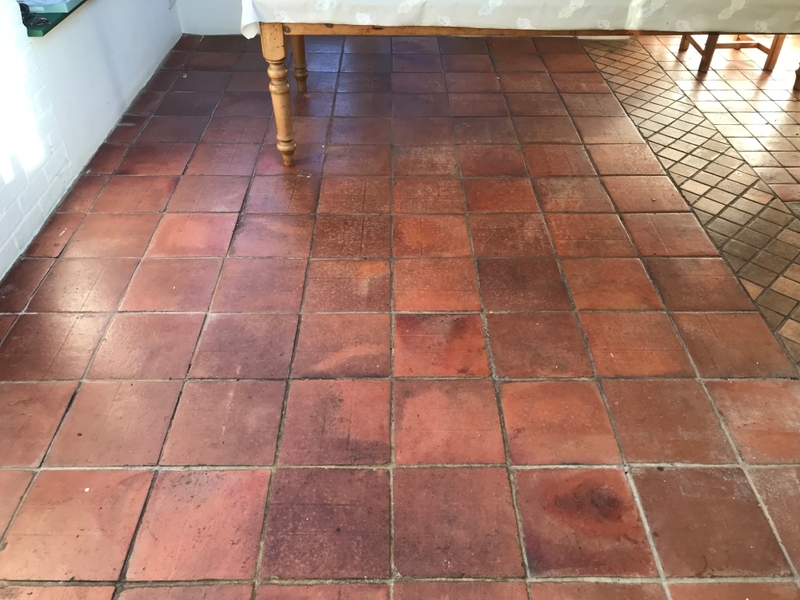 In this case the wax had deteriorated over the years and left the tiles looking tired and dirty. After reviewing the flooring, I demonstrated cleaning the tile and grout which went well and impressed the customer who after living with the floor looking dirty for some time was eager for the job to be completed. I gave the customer a price for renovating the whole floor which was agreed, and we set a date for the work to commence. 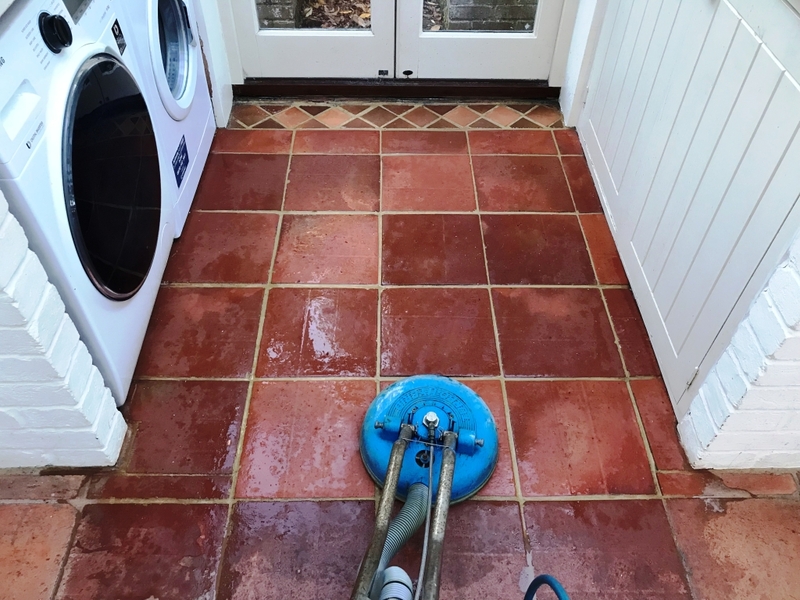 My first job was to strip off what remained of the wax sealer using Tile Doctor Remove and Go and a new Tile Doctor product called Wax Away which has been specifically designed for dealing with wax. Both products had very similar effects and together striped off the old coating with little issue. Of the two products my preference to use Wax Away as it foamed less when wet extracting with a spinner tool. After applying the Wax Away, I left it to dwell for fifteen minutes re-applying more product when it began to dry out. Leaving it to dwell allows it to penetrate the wax and weaken it so it’s easier to remove. I then used a 17-inch black scrubbing pad fitted to a rotary floor machine to scrub the solution into the tiles. Finally, I used a spinner tool fitted to a hot water pressure extraction system that is housed in my van to rinsed away and extract the resulting slurry. After the floor was clean, I set to work on the grout lines that still had traces of embedded wax sealer. 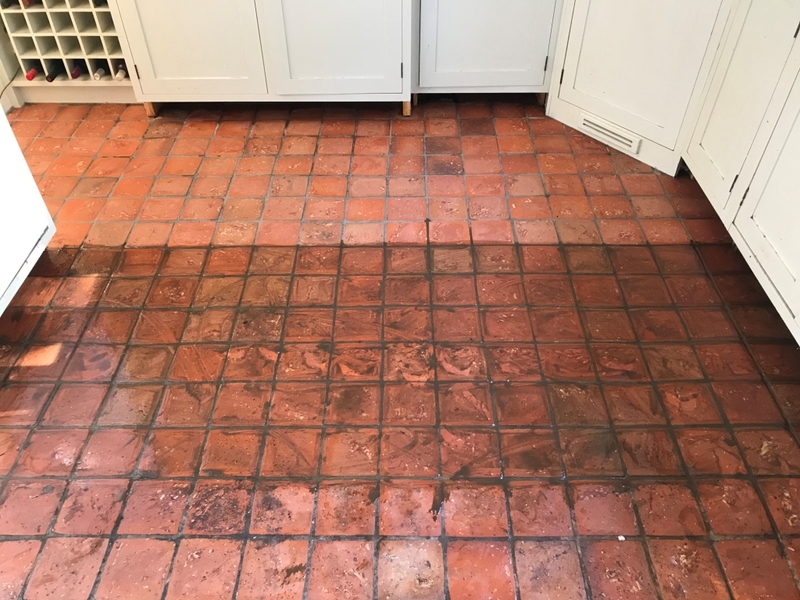 The floor pads can struggle to reach into the recesses of the grout, so the solution is to use a stiff grout brush and scrub them clean by hand assisted with Tile Doctor Pro-Clean which is out go to grout cleaning product. As a last step in the cleaning process I gave the floor and Acid Wash using Tile Doctor Grout Clean-up. I did this to further clean the floor and to neutralise Its pH after using so many high alkaline cleaning products. I returned at the end of the week and checked that the moisture levels of the floor, we always do this to ensure the floor is dry before sealing and would not recommend sealing a damp floor as the results can be patchy. The readings were spot on, so I was able to get a started. 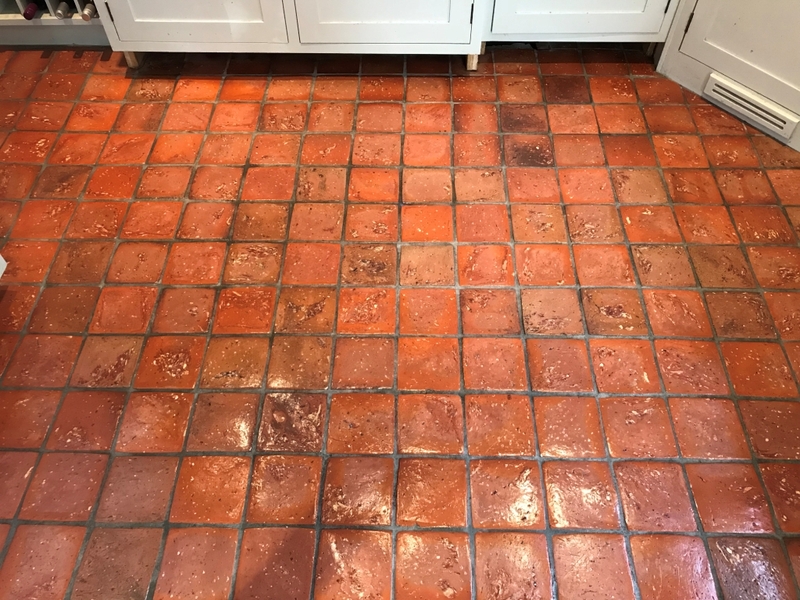 The customer wanted to keep the rich terracotta colours in the tile and wanted a sheen, so I selected Tile Doctor Seal and Go as the sealer. To fully seal the tiles, I used six coats on the smaller Quarry tiles and nine coats on the large Mexican Terracotta tiles. Seal and Go is a modern water-based acrylic sealer that provides both a stain resistant seal and a durable low-sheen finish, also being water based it doesn’t give off a smell as it dries. The result was a huge improvement, needless to say my customer was very pleased and left the following feedback. Luckily for this client in the village of Docking in Norfolk, the water pipe under her kitchen sink burst the day before she left for a four-week holiday in the USA, so at least she was able to turn the water off at the mains and minimise the damage before leaving for the airport… every cloud, as they say! 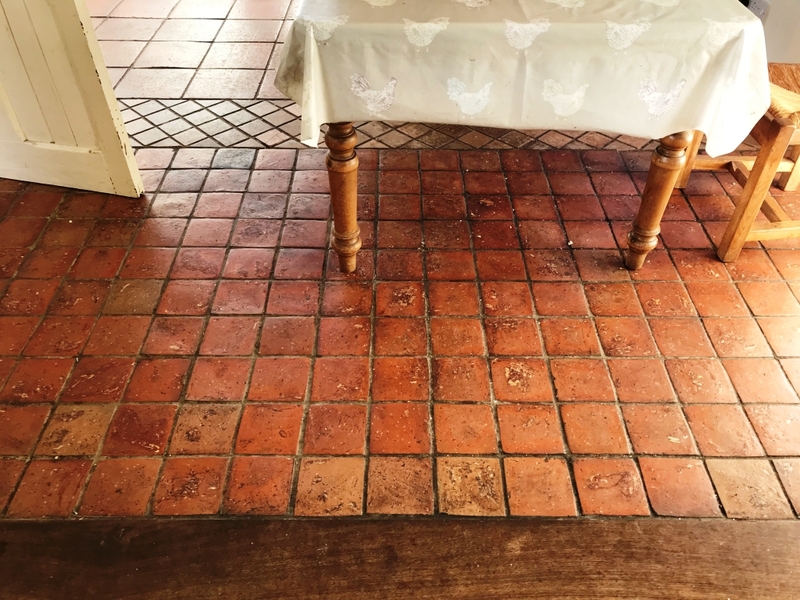 On her return she found that the Terracotta tiled flooring had dried out perfectly but unfortunately, the acrylic sealer had suffered badly as the evaporating moisture came up through it and the entire surface of the floor had developed a milky-white bloom. Our client thought that complete replacement of the whole floor, which ran from a large kitchen diner through to a long utility room with separate storage cupboards and a WC would be the only option. Fortunately, before investigating that expensive option she gave Tile Doctor a call in the hope that the floor could be saved. 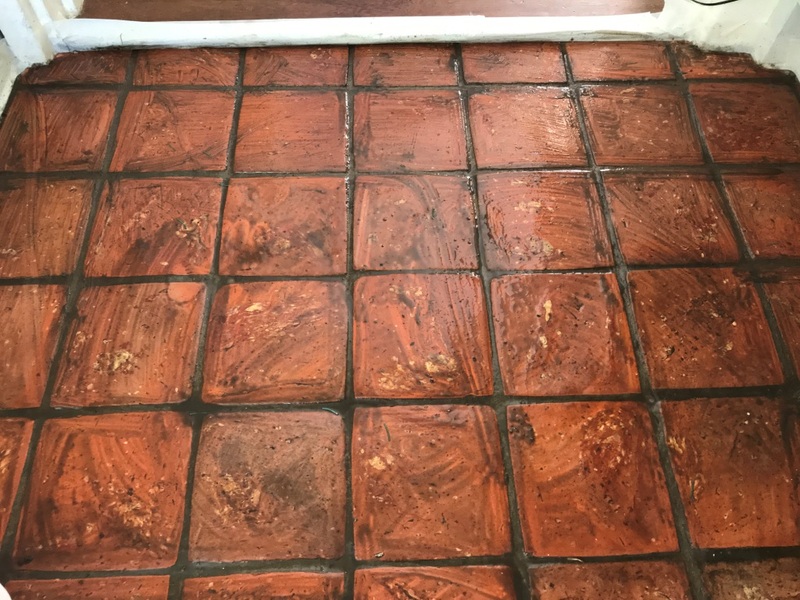 In order to remove the damaged acrylic sealer, we applied a strong dilution (1:2) of Tile Doctor Pro-Clean mixed with a little Tile Doctor Remove and Go. This was scrubbed in along with a small amount of honing powder using our 17″ rotary machine fitted with a medium nylon brush before being power rinsed and extracted to remove all the chemicals and resulting slurry. The grout lines, corners and edges where the original sealer had been applied more thickly were then further cleaned by hand with Tile Doctor Nanotech HBU Remover, HBU stands for Heavy Build-Up and this is a useful product for tackling stubborn areas. The floor was then finished off with very fine honing powder applied with water and a black scrubbing pad before being rinsed and extracted again. 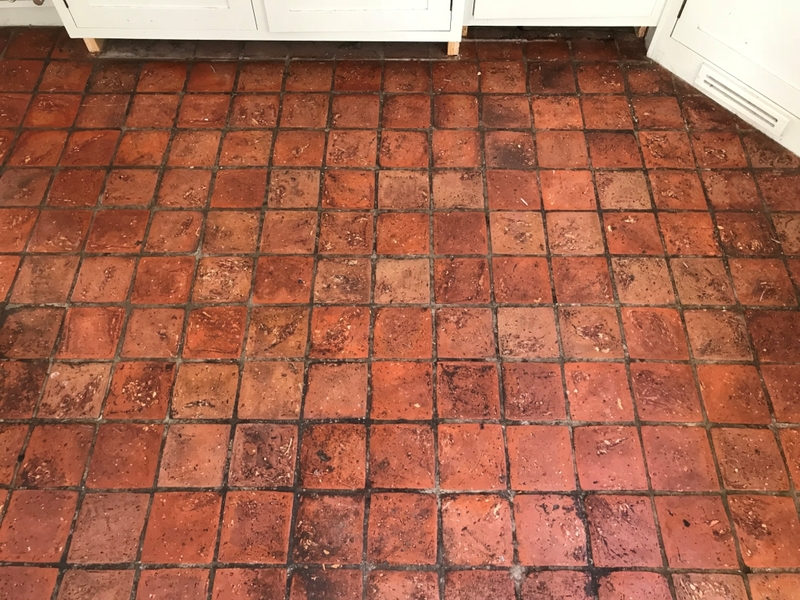 Finally, the whole floor was acid washed with Tile Doctor Acid Gel to neutralise all remaining cleaning agents and counter act any efflorescence salts which may appear in the future before being left to dry thoroughly overnight with the assistance of our dehumidifier. On our return the following day, the floor was thoroughly damp tested and found to have dried extremely well enabling us to start applying the new sealer straight away. The client had specified a muted shine surface for her floor, so we chose to use Tile Doctor Seal and Go. 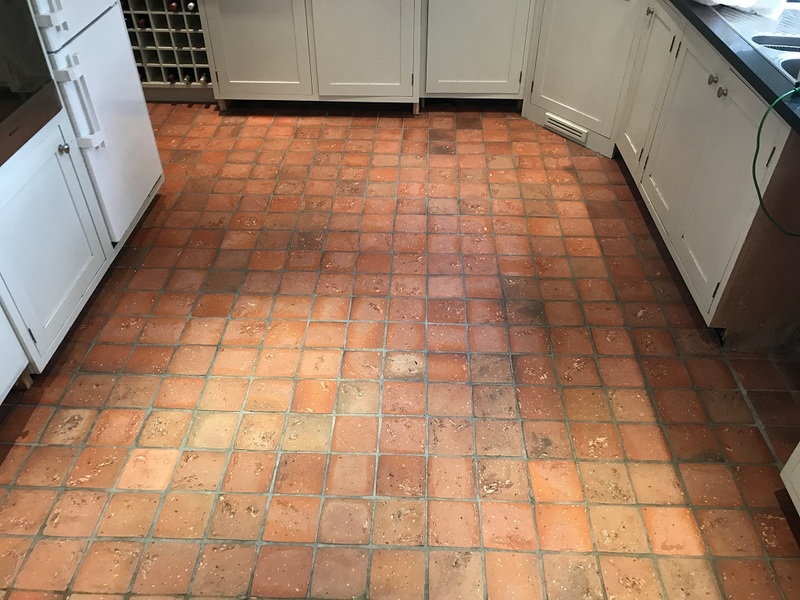 Terracotta is made from clay which is quite a porous material so seven coats were needed to completely seal the floor. This would provide optimum fluid resistance along with the mid-sheen finish she had requested. I am delighted with the work carried out. 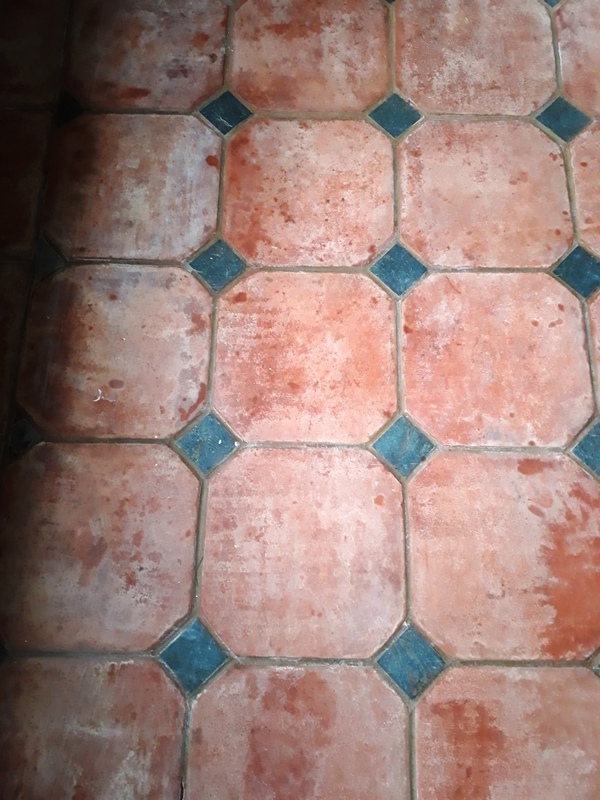 The terracotta tile floor of my kitchen was in a terrible state following a flood and it has been restored to an excellent condition. A very professional and personal service which I am happy to recommend.